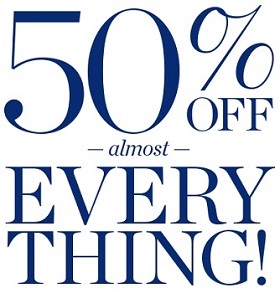 Receive 50% discount on almost everything at Talbots retail store in the U.S. or Talbots online. You can also take an extra 50% off markdown items for total savings of up to 70% off original prices. Do not miss this amazing offer. Source of the information is Talbots. Offer is valid until July 24, 2016. For more details about the offer visit any Talbots retail store in the U.S. or Talbots online.